For more than 40 years, more than 8,600 dedicated nurses have chosen to certify in wound, ostomy, continence and foot care nursing through the WOCNCB. The Wound, Ostomy and Continence Nursing Certification Board encourages you to keep them active because of the value they bring to you. 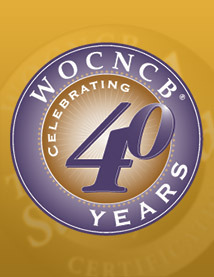 For a number of years the WOCNCB has reached out to its certificants in need with a helping hand. We know that our members are sometimes dealing with the consequences of either personal or natural disasters. Now LPN/LVN or RNs can use wound care experience towards eligibility for the WTA-C® Exam! The WTA-C® 5 year certification is $250.00. Become Certified! Read the latest issue of the Certification eNews. Be Better Prepared to Pass the Wound, Ostomy, Continence and Foot Care Exams - Study with the OFFICIAL WOCNCB Flash Card Sets! NEW! Foot Care Flash Cards Now Available. Order today! Each set contains approximately 200 questions and is developed in conjunction with 2014 detailed Care Exam Content Outline.